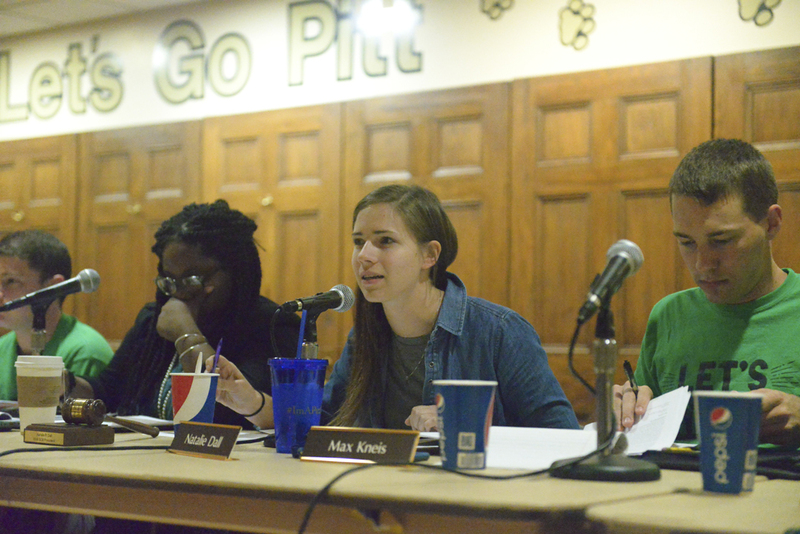 Joining more than 500 other students who signed and circulated an online petition over the weekend, Pitt’s Student Government Board weighed in on the vacant psychiatrist positions at the University Counseling Center. With one position empty from a psychiatrist who retired over the summer and the second and only other psychiatrist set to leave Friday, students voiced anger over what they say is a lack of support for mental health services. In an open letter SGB President Natalie Dall read Tuesday night, SGB acknowledged the upsetting nature of the vacancies while also recognizing University efforts to fill the positions. The letter aimed to give clarity to what is happening with psychiatric care at the University, Dall said. Dall and other members of SGB became aware of the petition when it went public last Friday and moved to look into the petition’s claims as well as the University’s actions to rectify the situation. As the SGB representative to the Mental Health Task Force, Board member Max Kneis said he started to research the situation as soon as he saw the petition last Friday. “I was quickly on the phone with the director of the Counseling Center and then with the girl who started the petition,” Kneis said. Through this research, SGB was able to understand both sides and craft an appropriate response, Kneis said. In the open letter addressed “to the University community,” SGB described the University’s efforts to find and interview adequate candidates for the vacant psychiatric positions. The search, which began in May, has failed to yield any qualified candidates thus far. The letter notes that any students who had been seeing a University psychiatrist have been connected with community partners at Western Psychiatric Institute and Clinic of UPMC or other local psychiatrists accepting patients, Dall said. “We all understand that the access to psychiatric care is not perfect, but we need to keep students and the University talking about it,” Kneis said. The letter ended by emphasizing SGB’s commitment to continuing the discussion of mental health throughout the year by organizing and advertising programs that demonstrate the importance of maintaining a good state of mental health like the upcoming suicide prevention workshop and other programs Student Affairs offers. Because October is Mental Health Awareness month, SGB will continue to educate students and to pursue initiatives that raise awareness, Dall said. The letter notes that the University is also working to accommodate all student needs through community resources, if necessary. “I know that they’re working very hard to have at least an interim position as soon as possible,” Kneis said. Pitt spokesperson Shawn Ahearn responded to the petition in a statement posted on the Student Affair’s Facebook page and emailed to The Pitt News. In other news, SGB introduced a bill supporting legislation to instigate harsher punishment for intimidation based on gender identity and sexual orientation. In 2008, the Pennsylvania Supreme Court ruled in a case and declared the distinctions of sexual orientation and gender identity for hate crimes unconstitutional. By removing these distinctions from the ethnic intimidation law, the penalties for these hate crimes were greatly lessened. SGB’s bill, which the Pitt Rainbow Alliance co-sponsored, arose from the Pennsylvania Association of State-Affiliated Schools Conference that Pitt hosted last month. The Penn State University SGB had already passed a bill of their own supporting HB 218 and encouraged the other members of PASS to write bills as well. All the attendees agreed to look into it and hopefully make it a PASS-wide effort, Fisher said. After the conference, Dall introduced the idea to the rest of the Board and began to craft the language for the bill. The bill was introduced publicly last night and will be officially voted on at the SGB meeting next Tuesday night. If the bill passes, SGB will send a letter to members of the Pennsylvania legislature urging the passage of HB 218. The bill, which Kevin J. Boyle, D-Montgomery County sponsored, is scheduled to be voted on on Oct. 25 in the judiciary committee. University of Pittsburgh Rotaract: Pitt Rotaract requested $1,354.88 to attend Rotary at the United Nations conference this year. The Board approved $1,152.88 and denied $202. National Student Language Hearing Association: The NSLHA at Pitt requested $2006 to attend the American Student Language Hearing Association Convention. The Board denied in full. Engineering Student Council: The Pitt Engineering Student Council requested $174.37 to fund their Fall Fest. The Board approved $124.85 and denied $49.52.